Brian Michael Bendis adds Frank Castle to an already-volatile mix! Next week, writer Brian Michael Bendis and artist David Marquez unleash Iron Fist, Daredevil, Luke Cage, and Jessica Jones upon the streets of the Marvel Universe as the newest members of the Defenders! While the timing for this new series couldn’t be better as the Netflix show of the same name prepares to launch later this summer, Bendis wants to make it clear the comic provides readers with an entirely different story despite keeping the same core characters. And viewers who were fans of Jon Bernthal’s Punisher on the second season of “Marvel’s Daredevil” get a full-dose of four-colored chaos with this first story arc as Frank Castle comes head-to-head with the team. 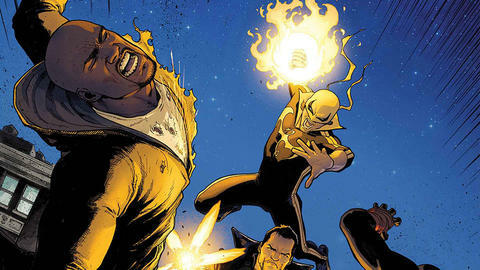 We spoke with Bendis about what we can expect from DEFENDERS as this vigilante finds himself sharing the scene with Marvel’s premiere street-level heroes. Marvel.com: Brian, you are no stranger to the streets of the Marvel Universe having spent a good deal of time carving out a name for yourself with many of the main players from DEFENDERS. How will this series give you a chance to tell a different story with these characters? Brian Michael Bendis: What’s cool is that they’re completely different than when I was writing DAREDEVIL and ALIAS. Over the years, you know, the streets of Marvel reflect the real world, even more than anything I can think of in pop culture, other than the “Law & Order” plots. But we really feel like it’s really New York! I know these addresses in these books. So, think about how much has changed in real life from then. It’s a lot and that will be reflected a great deal in the book itself. The relationships between the characters are very solid, which is quite a beautiful thing, and that’s one more gift that you get with having characters with their history. Their relationships are solid, but with those solid relationships comes more to lose. What I enjoyed the most about writing Luke Cage now is that he has unbreakable skin so he can’t get hurt; but now he’s got a family, so you can hurt him. You can hurt him pretty good. Those are very different versions of the character: his life on the street and his life at home. Daredevil’s relationship with the characters is different now, too. His identity is secret again, and that’s a different thing as well. So, the relationships are something I love to explore. Holding their relationships in the firing line of the biggest bad guys of the streets of Marvel is very exciting to write. To me, that’s the biggest difference. Marvel.com: The streets are rough and “survival of the fittest” seems to be one rule that permeates these kinds of stories. That said the individual heroes from DEFENDERS make it a point to avoid killing whenever possible. Do you think that’s an important rule for super heroes to follow? How so? Brian Michael Bendis: Yeah, and I’m not going to say what that moral code should be, but whatever that moral code is that a hero says that he (or she) represents, he (or she) cannot vary from it. Ever. You know, the quintessential story is Spider-Man. He takes on Doctor Octopus, a bag of money falls, and there is nobody there. If he takes a chunk of it, he can go buy Aunt May her medicine, and no one will ever know. Except that if he ever does it, he’s not Spider-Man anymore. You can never go back. And I think that the same goes for all of these characters. There is a moral center. Luke has his, Jessica has hers, Danny has his, and Matt has his, and they can’t vary from their respective. However, what’s cool is that they all have different moral codes. I mean Jessica’s and Danny’s are pretty similar but Matt’s is different and we have other characters that come into the book as well. I think the one that speaks to this more than anyone else is The Punisher. Marvel.com: Naturally, this leads us to Frank Castle—one of the defining examples of the “anti-hero.” What do you think readers find appealing with The Punisher? Brian Michael Bendis: When I was deciding about what to put in DEFENDERS and what not to put in, someone on Tumblr had posted the original designs of The Punisher. You know he’s got kind of a widow’s peak hairline, pretty much what you see now but a little different. Maybe a little bit more of like a mob guy. So, I was reading the article and it spoke about where he came from with some saying Charles Bronson helped inspire the character, and the thing is that Charles Bronson was really an answer to Watergate and the question “Will someone please take care of the bad guys? They’re getting away with everything!” I can’t think of a time in my life that has felt more like [that] than now. I’m not trying to politicize it but the present day is all kind of chaotic and crazy. A lot of people are getting away with [expletive], and so I think it’s a good time for The Punisher to be becoming a TV star and surfacing in our comic. Marvel.com: But after decades of bumping up against his fellow costumed do-gooders, wouldn’t the other super heroes rub off on Frank and influence him to back off from his lethal brand of justice? Wouldn’t their collective arguments have any sort of effect on his approach to dealing with criminals? Brian Michael Bendis: Or the opposite, that their ways of doing things [don’t] work at all and his does. We have their version of running around in costumes, smacking around guys in a pool hall; meanwhile, what’s different decades later? That would be his argument. Some of this you’re going to see in the book. Knowing that he will be coming into contact with the Defenders, which hero do you think Frank Castle will get on the best with, and which do you think he will bump heads with the most? Brian Michael Bendis: You bring up a good question. What I found was interesting, is I did also have to ask myself that question of “Who here does Frank respond to the most? And who is he disgusted by the most?” and how do you [feel] being in the room with The Punisher once you have a child? Once I had children, even if they weren’t there, sometimes I wouldn’t want to be in the same room as certain people because I had children. Frank Castle is [not] someone you want to be in the room with. In DEFENDERS, there is someone who Frank has an insane amount of respect for, and the other ones he does not. I know everyone is going to think its Jessica Jones because [I’m her] co-creator, but no. Just want to put that out there. Marvel.com: That was actually one of the things that I was thinking about! At first blush, it seems she would be the person that Frank might relate to the most, personality wise. But the Jessica Jones in the comics—and I’m telling you what you already know—finds herself farther along in life than her TV counterpart and shows us a different character than fans of the Netflix series are aware of. After all, your Jessica Jones has a child and that changes the chemistry of her viewpoint on Frank, no? Brian Michael Bendis: Yeah that’s true, I think that would be a good compare and contrast between the comic book version and the TV version, something like that, you know, how they would respond to Frank Castle at this point. Marvel.com: You mentioned that The Punisher finds himself experiencing another “moment in time,” that we need heroes like him for today. I don’t want you to spoil things, but how does Frank open up things for you as a storyteller that might not otherwise be available if you were really only working with the four primary Defenders? Brian Michael Bendis: Well, it depends on what perspective we’re dealing with here. If you’re working on the story that’s from Frank’s perspective, then it’s very different from the story where [it’s] other people’s perspective of Frank. For a great deal of what I’m doing in DEFENDERS, it is the Defenders’ perspective of Frank and the mystery box that is Frank. He doesn’t text everyone and tell everyone his plan. He does some ballsy and brassy things to the Defenders. What I love about him, to answer your original question, is that it’s like the Angel of Death comes to the story. There are the good guys vs bad guys and then the Angel of Death shows up and you don’t know who he is for, we don’t know why and we don’t know when, and it’s pretty amazing. When I’m writing him, you not only hear about him and his days in other places but you also get what people think about Frank. That is so much scarier than he actually is. In real life, he is a wounded soul, but everyone’s perspective of him is terror. Think about it: Whenever somebody says “I’m going to punish you for your sins”—and everyone knows they’ve done something wrong—or they start to think “what have I done for him to punish me?” you get terrified! Marvel.com: I know you’ve mentioned some of your other series that you’ve worked on where the ending was pretty definitive, and you knew where you were going. Then again, there were other times where you worked in some flexibility worked, and the story goes in different directions. When you have a character like the epitome of the Angel of Death, and you introduce him into your storyline, does that change things for you when you’re writing out the story? 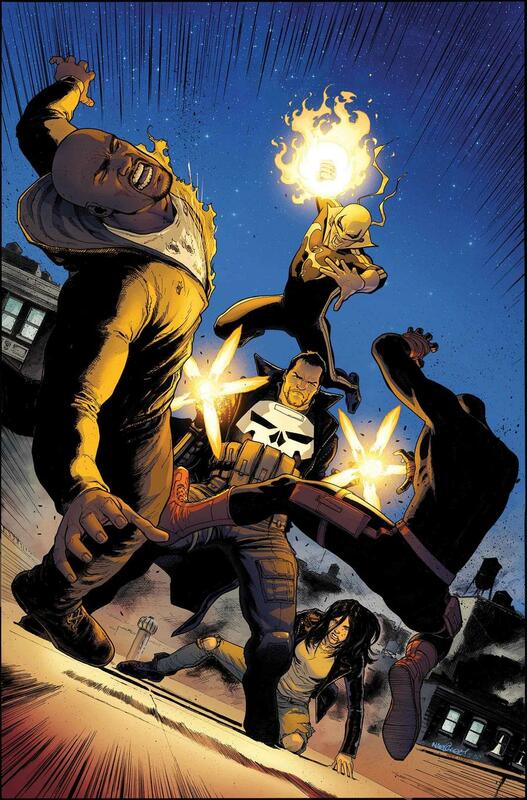 But yeah, if you like The Punisher, stay tuned to DEFENDERS. You’re going to love it. Frank Castle takes on the team in DEFENDERS #3, available July 12 from Brian Michael Bendis and David Marquez—and be sure to pick up issue #1, on sale next week!